The Pittsburgh Vengeance evened the weekend series against the Niagara Falls Thunder with a 5-4 victory Sunday morning at the Alpha Ice Complex in Pittsburgh. Both teams are 1-1 after the first week of play in the Premier Division of the USPHL. Kenny White opened the scoring for the Vengeance 5:27 into the first period. Anthony Purdue supplied the assist. Pittsburgh took a 2-0 lead on the powerplay with a goal by Joar Rosengard at 7:30. Nick Ventura and Jeremy Jenkins assisted on the play. Niagara Falls drew within one when Tristen Mock found the back of the net at 9:06, with Spencer Hyrnczak and Kevin McElligott grabbing the assists. Justin Zweig tied it for the Thunder 8:40 into the second period. The power play marker was assisted by Pat Faliero and Jared Matley. The Vengeance regained the lead 11:58 into the period off the stick of Tyler Duderstadt on the power play. Benjamin Oslick and Michael Hertzberg assisted. The Thunder answered back 24 seconds later. Mock’s second goal of the game was a shorthanded goal, assisted by Brandon Schweickert. Nick Erker then scored a shorthanded goal for the Vengeance after a block on the blue line for a breakaway at 14:55. Nick Ventura gave Pittsburgh a 5-3 lead 13:11 into the third period. Jenkins and Rosengard assisted on the power play goal. Niagara Falls got one more goal to close within 5-4. Jeremy Ienco tallied that goal with only 29 seconds left on the clock. Another power play goal. Joe Shanley and Brandon Schweickert had the assists. Landon Anderson stopped 32 of 36 shots in the win for Pittsburgh. Kris Augustine turned away 26 of 31 in net for the Thunder. Niagara Falls was 2 for 6 with the extra man while the Vengeance were 3 for 6. The next games for the Thunder will be at the Hyde Park Ice Pavilion in Niagara Falls September 28th and 29th against the Connecticut Knighthawks. Game time for Friday night’s game is set for 7:30pm. Saturday’s game is scheduled to get under way at 6pm. 1st Period-1, Pittsburgh Vengeance, White 1 (Purdue), 5:27. 2, Pittsburgh Vengeance, Rosengard 1 (Ventura, Jenkins), 7:30 (PP). 3, Niagara Falls Thunder, Mock 1 (Hrynczak, McElligott), 9:06. Penalties-Mock Nft (tripping), 5:49; Erker Pgv (hooking), 18:47. 2nd Period-4, Niagara Falls Thunder, Zwieg 1 (Faliero, Matley), 8:40 (PP). 5, Pittsburgh Vengeance, Duderstadt 1 (Oslick, Hertzberg), 11:58 (PP). 6, Niagara Falls Thunder, Mock 2 (Schweickert), 12:22 (SH). 7, Pittsburgh Vengeance, Erker 1 14:55 (SH). Penalties-Bates Pgv (tripping), 2:36; served by Hrynczak Nft (bench -too many players on the ice), 3:53; Oslick Pgv (roughing), 6:54; Hrynczak Nft (roughing), 10:31; Schweickert Nft (tripping), 10:31; Kirk Pgv (high-sticking), 13:21. 3rd Period-8, Pittsburgh Vengeance, Ventura 1 (Jenkins, Rosengard), 13:11 (PP). 9, Niagara Falls Thunder, Ienco 1 (Shanley, Schweickert), 19:31 (PP). Penalties-Mock Nft (slashing), 9:48; Zwieg Nft (hooking), 12:55; Duderstadt Pgv (tripping), 17:36; Sturny Pgv (tripping), 19:08; Engelhardt Nft (roughing, misconduct-continuing or attempting to continue a fight), 20:00; Ienco Nft (slashing, misconduct-use of profane or abusive language, disqualification-contact to the head), 20:00. Shots on Goal-Niagara Falls Thunder 8-16-12-36. Pittsburgh Vengeance 8-13-10-31. Power Play Opportunities-Niagara Falls Thunder 2 / 6; Pittsburgh Vengeance 3 / 6. 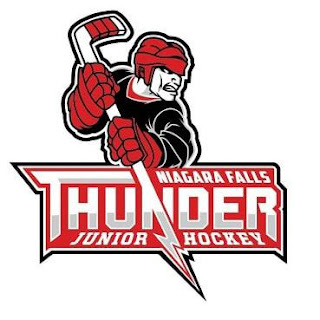 Goalies-Niagara Falls Thunder, Augustine 0-1-0-0 (31 shots-26 saves). Pittsburgh Vengeance, Anderson 1-0-0-0 (36 shots-32 saves).